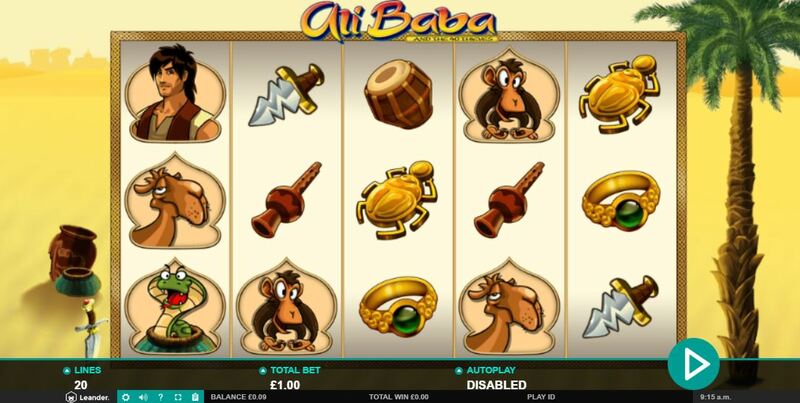 It’s time to experience the famous Arabian tale re-told with Ali Baba’s video slot game. Taking you deep into the heart of the desert, the aim of the slot is to find the hidden treasures. But there’s one problem – claiming your riches isn’t as simple as ‘open sesame’. These shiny rewards are hiding in the caves of 40 thieves. Fitting in with the slot’s theme, you’ll find an array of symbols from a camel to a golden beetle and snakes. Ali Baba has already gone down in history, so now it’s your turn. Can you live up to the legend’s name? Play slots UK online now! Leander Games haven’t been part of the casino industry for years, but that’s what makes them so fascinating. Only entering the scene in 2008, their short success has seen them produce some fantastic titles among their portfolio. They also have a big following, particularly since they tapped into the Latin America market. Known for their wide range of slots with many focusing on traditional casino games, and others more unique in their themes and design, your gaming choices are endless. What’s more, they have an extremely experienced team who work hard to bring their innovative ideas to life. Click now for more slot games by Leander Games! To start, you will need to choose how many active playlines you want from 1 to 20. Then, it’s time to decide your stake. Once these are set up, spin away. As always some symbols are more lucrative than others, and in this case you need to look out for the Arabian princess, who bears a striking resemblance to Aladdin’s princess Jasmine. As the game’s expanding WILD, she stands in for all icons apart from the bonus and SCATTER and will cover the whole reel. The slot also has some exciting bonus features such as Gold or Bandit Bonus. This round is triggered when 3 red vase symbols land on reels 2, 3, or 4. This is where your luck will come in as you will be presented with 6 vases in an attempt to locate the hidden gold. Don’t be surprised if you come across a monkey either, this mischievous fellow may come in handy as he destroys one of your vases, potentially leading to greater winnings. There’s also a Free Spins round, which is activated by the pots of gold SCATTER. This will result in a winning pick’em feature, the prizes revealed could lead to greater Free Spins and multipliers, so choose carefully. For those who want to win the biggest prize pot in the game, your success relies on one symbol – the legend himself, Ali Baba! Land 5 across any of your active paylines and you’ll be rewarded with the game’s biggest payout, 2,500x your line bet.